When water or a moisture problem leads to a mold problem, AAS Restoration & Roofing’s certified mold remediation team can assess and mitigate the most complicated remediation project. Thanks to advanced training through IICRC, IAQA, and CCRN, our certified technicians make up one of the most knowledgeable and professional response team in the Kansas City area. Whether mold is confined to a small area within a single room or is distributed throughout an entire building, AAS Restoration employs the most up-to-date industry standards to safeguard inhabitants, and returns the environment to a healthy condition as quickly and safely as possible. 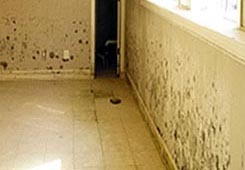 The mold-remediation process includes identification, containment, and removal of mold. With all mold losses a Certified Industrial Hygienist conducts an air-quality test before remediation begins. The hygienist writes the protocol to address the contamination, and AAS Restoration adheres to this standard. Following decontamination procedures, a post air-quality test for occupancy clearance is conducted by the hygienist. Once the mold has been mitigated by our mold technicians, AAS Restoration’s reconstruction division will repair any damage caused by the mitigation.